What is rewarding to you about being an instructor? 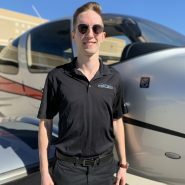 The most rewarding part of being a CFI is that moment when the student finally achieves their goals. After all the hard work that students put in they are able to see how everything comes together for success. I remember starting my flight training process from hour zero and thinking this is going to be a lot of time and effort. It definitely was, but it was also extremely satisfying to see my progression. Luckily I had some of the best instructors to learn from. All I want to do is be the best flight instructor I can be and make my students feel comfortable and confident. At the beginning of each lesson I will always remind my students what we are going to learn, have fun, but most importantly be safe.